This week The Broke and the Bookish asked for ten books recently added to my TBR list. Seriously? Do they know me? I can easily add five books a day on my ever growing TBR list. I LOVE lists and books are not immune to the crazy. So…which to feature today on the meme? The Unamericans (2014) – Molly Antopol. Well I can’t kick myself for not reading anything by Antopol. This was a debut collection last year featuring “a stunning exploration of characters shaped by the forces of history”. The Feast of Love (2000) – Charles Baxter. A re-imagining of A Midsummer Night’s Dream covering topics surrounding love. His latest collection, There’s Something I Want You To Do, was released in February 2015, fifteen years after this one. Wanna start here, though. Birds of a Lesser Paradise (2012) – Megan Mayhew Bergman. Hearing great things about her latest collection, Almost Famous Women automatically had me adding both to my TBR list. Astray (2012) – Emma Donoghue. No I haven’t read Room or Frog Music. So where should I start? No One Belongs Here More Than You (2005) – Miranda July. Getting some buzz with recent collection, The First Bad Man, had me looking into her backlist. So they both got added. Magic For Beginners (2005) – Kelly Link. My coworker can’t rave enough about Kelly Link with her stories combining fantasy, magical realism and some horror AND her latest collection Get in Trouble is also buzzing around the book reviews. I’m seeing a pattern here. I hear about a new book by a new-to-me author and ALL of their books end up on my TBR list. I have this weird mindset sometimes where I feel I need to read their earlier collection first. Don’t ask. Binocular Vision (2011) – Edith Pearlman. This collection combines vintage stories as well as new ones taking the reader all over the world. Aaaand surprise, Honeydew, her latest came out this year in January. Caught me again. Blueprints for Building Better Girls (2011) – Elisa Schappell. Eight linked stories that follow female characters from the 1970s to present day. We Live in Water (2013) – Jess Walter. To balance the feminism in Blueprints, we have a collection “of lost fathers and redemptive conmen, of meth tweakers on desperate odysseys and men committing suicide by fishing.” Beautiful Ruins has been on my shelf for almost three years and is going in my beach bag. I hope to scratch it off my list finally! What have you recently added to your TBR list? 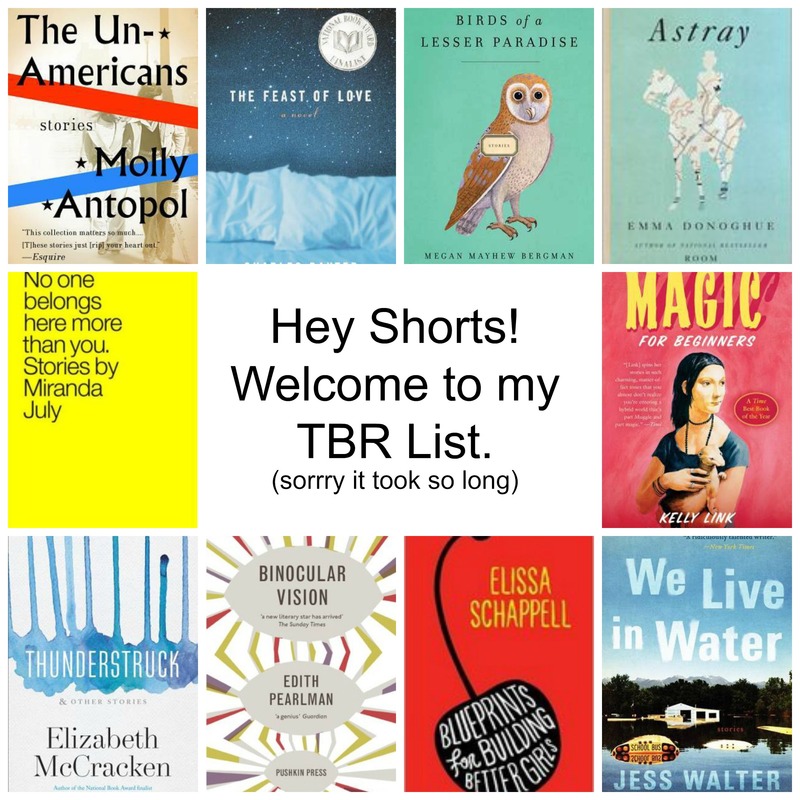 Tags: Charles Baxter, Edith Pearlman, Elisa Schappell, Elizabeth McCracken, Emma Donoghue, Jess Walter, Kelly Link, Megan Mayhew Bergman, Miranda July, Molly Antopol, recently added to my TBR list, short stories, top ten tuesday. Bookmark the permalink. I loved Birds of a Lesser Paradise, Astray and The Unamericans are on my TBR shelf, and I want to read Thunderstruck and Blueprints for Building Better Girls! So many great collections to read! I am the polar opposite of you and generally cannot connect with short stories. My own failing. I do keep trying, and there are several collections that I love, including MMB’s Birds of a Lesser Paradise. Loved that collection. I’ll be curious to hear your thoughts on the others and maybe take a chance on one or more. It really depends on the writer, the collection, the style. There are some that left me scratching my head and some I can’t forget. Glad to hear that you liked Birds of a Lesser Paradise! I have a hard time connecting with short stories too, but want to keep trying. I forgot about some of the books on your list. I didn’t finish The First Bad Man because I had to return it to the library, but I’m definitely interested in reading more of Miranda July’s work. Keep trying! Like I responded above, there are some that are misses for me and some that I really connected to. Maybe even only one in an entire collection. I’m curious about Miranda July as well.